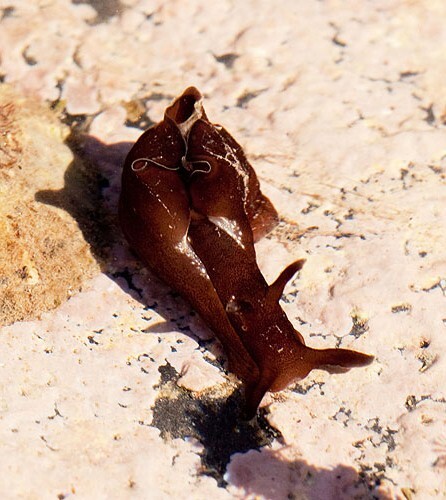 The Sea Hare has two pairs of tentacles and two large flaps (parapodia). The upper pair of tentacles are said to resemble Hare’s ears, hence the common name . Young hares are reddish / turning brown with blotches with age . It is not a true sea slug , as it possesses a shell. The small thin internal shell is largely covered by the large wing-like body flaps which also protect their gills / Herbivores , preferring seaweed / Each sea hare is both male and female , being a simultaneous hermaphrodite. They are known to form long mating chains, with each animal being a male to the one in front of it and female to the one behind / Comes to the shore in the summer to lay its eggs / in cocoons / hundreds embedded in a long pink string of spawn .